In the ’50s and ’60s, Simplicity released their popular line of Jiffy sewing patterns, which had minimal pattern pieces and simple constructions, yet were chic enough for fashion-conscious customers. 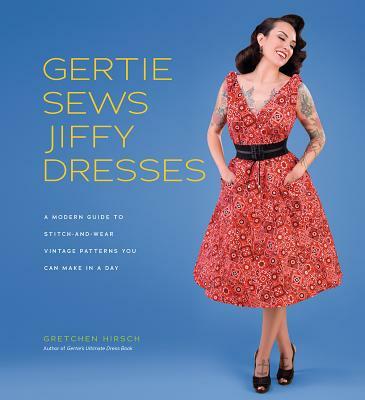 This approach appeals now more than ever as stylish women are continuously looking for ways to fit their love of sewing into busy lives filled with family, work, school, and countless other obligations.Gertie Sews Jiffy Dresses is Gretchen Hirsch’s modern reinvention of this simple idea, focusing on easily mastered sewing skills, minimal pattern pieces, and fabulous designs. And the best part? Readers will end up with a sparkling wardrobe of easy-to-wear, fun-to-style dresses that will fill busy modern lives with retro charm.